Brussels Airlines (bmi Regional) Embraer ERJ-145EP G-RJXI (719981) | Flickr - Photo Sharing! Brussels Airlines (bmi Regional) Embraer ERJ-145EP G-RJXI is on short final for runway 25L in Frankfurt. c/n 145454 has had its first flight in June 2001 with the test registration PT-SUZ and was delivered to bmi Regional on 22.06.01. It was painted in the "Star Alliance" livery until May 2012. 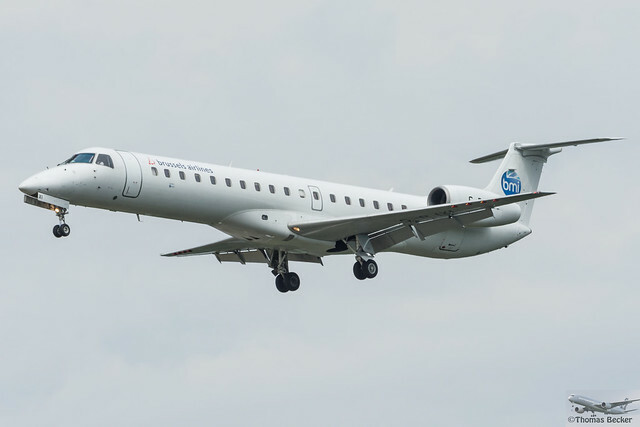 On 30.03.14 it was transferred to Brussels Airlines and is now operated by bmi Regional. The jet is powered by 2x AN AE3007A1/1 turbofans and has a variable cabin layout with 49 Business and Economy Class seats. This is flight BM1825 from Bristol (BRS). www.fabienrouire.com, Zsolt Máté, and 6 other people added this photo to their favorites.